Acar MA, Erkocak OF, Aydin BK, Altan E, Senaran H, Elmadag NM. Patients with Black Hip and Black Knee Due to Ochronotic Arthropathy: Case Report and Review of Literature. Oman Med J 2013 Nov; 28(6):448-449. Alkaptonuria is a rare autosomal recessive disease that affects one in 250,000-1 million people. Alkaptonuria is a metabolic disorder caused by the lack of homogentisic acid oxidase enzyme. Homogentisate polymers accumulate and cause urine darkening (called alkaptonuria), brown black pigmentation of connective tissue (called ochronosis), articular cartilage pathology, osteoporosis and pathomorphologic changes in internal organs. There is no known medical treatment for alkaptonuria. The management of ochronotic arthropathy is usually conservative, but replacement surgery must be offered for severely affected major joints. A few reports of surgical treatment of ochronotic arthropathy have been published. This report describes a case of ochronotic hip and knee arthritis treated with total hip and knee arthroplasties. The literature, differential diagnosis and management of this rare condition are reviewed in this article. A 62-year-old woman was first admitted to an orthopaedic clinic for assessment of pain in her right hip, left knee, and shoulders. She took physical therapy and nonsteroidal anti-inflammatory drugs which provided some relief in her joints. She had no family history of metabolic or physical abnormalities. Two-and-a-half years later, the patient was referred to our clinic due to pain and limitation of knee and hip motion. During physical examination, a characteristic dark blue pigmentation was found in the auricles and sclera of the eyes. A major reduction in range of motion was noted for the entire length of the vertebral column. Radiographs revealed narrowing of the intervertebral spaces and fusion of vertebral bodies. Arthritis was noted in the right hip joint, bilateral knee joints, and bilateral shoulder joint (Fig. 1). The patient’s primary complaint was severe right hip and left knee pain. An examination of the urine revealed a brownish-black color when exposed to air. In addition, a high level of homogentisic acid was found in the urine. A diagnosis of ochronotic spondylopathy was established. Figure 1: Preoperative appearance and plain radiographs: A) Ochronotic pigmentation of the sclera; B) Black-blue pigmentation of the external ear; C) Anteroposterior and lateral radiograph of the lumbar spine; D) Anteroposterior radiograph of the hips; E) Anteroposterior radiograph of the knees; F) Antero-posterior radiograph of the right shoulder. Figure 2: Ochronotic joint manifestations: A) Head of the femur; B) Intraoperatively, the joint surfaces. Figure 3: Postoperative plain radiographs: A) Antero-posterior radiograph of the right hip showing cementless total hip prosthesis; B) Antero-posterior radiograph of cemented total knee prosthesis; C) Lateral radiograph of cemented total knee prosthesis. Alkaptonuria is a rare pathologic condition that is passed as an autosomal recessive trait in most cases.1 Caused by mutations in the homogentisate 1, 2- dioxygenase gene,2 it occurs in less than 1 in a million births.3,4 The first sign of alkaptonuria is often a change in urine color.5 Darkening of the urine and discoloration of the external ear and sclerae may be overlooked by patients and their family members. Therefore, the diagnosis of alkaptonuria may be delayed until ochronosis has developed. Our patient was not conscious of any of these properties until examined. Weight-bearing joints are usually affected in ochronotic arthritis. The knees are most frequently affected, while hip and shoulder joints can also be affected. Signs of ochronotic arthritis may resemble those of rheumatoid arthritis and ankylosing spondylitis.6 In ochronotic arthritis, small joints usually are not spared. However, osteophytic changes are not as evident as in osteoarthritis. In our case, degeneration of the hip and knee joints was the main cause of the symptoms. There is no specific treatment for ochronotic arthritis. Joint manifestations might be mitigable if homogentisic acid accumulation and deposition could be diminished by dietary limitation of phenylalanine and tyrosine. Ascorbic acid prevents oxidation and polymerization of homogentisic acid in vitro, but the efficacy of this form of treatment has not been established.7 The usual arthritic drugs and physiotherapy decrease joint symptoms in the early stage of ochronotic arthritis but do not decrease the rate of degeneration of joints. Complaints due to degeneration of the joints, especially hip and knee joints, and the treatment regimes were also described in the literature.8-10 In the late stages of arthritis, orthopedic surgery is prominent. In our case, hip and knee arthroplasty were conducted after the conservative treatment failed. Ochronosis is a rare metabolic disorder that affects peripheral joints as well as spine and soft tissue. There is no absolute cure for ochronotic arthropathy, but replacement surgery is offered. Total joint arthroplasties of the hip and knee joints greatly improve the physical activity of the patient. 1. Keller JM, Macaulay W, Nercessian OA, Jaffe IA. New developments in ochronosis: review of the literature. Rheumato lnt 2005; 25:81-5. 2. Phornphutkul C, Introne WJ, Perry MB, Bernardini I, Murphey MD, Fitzpatrick DL, et al. Natural history of alkaptonuria. N Engl J Med 2002 Dec;347(26):2111-2121. 3. Sahin G, Milcan A, Bağiş S, Köktürk A, Pata C, Erdoğan C. A case of ochronosis: upper extremity involvement. Rheumatol Int 2001 Oct;21(2):78-80. 4. Manoj Kumar RV, Rajasekaran S. Spontaneous tendon ruptures in alkaptonuria. J Bone Joint Surg Br 2003 Aug;85(6):883-886. 5. Resnick D. Alkaptonuria. In: Resnick D, Niwayama G, eds. Diagnosis of Bone and Joint Disorders. Philadelphia, PA: WB Saunders; 1988; 1787-1803. 6. 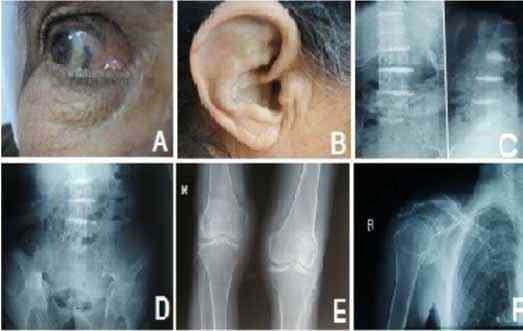 Hamdi N, Cooke TD, Hassan B. Ochronotic arthropathy: case report and review of the literature. Int Orthop 1999;23(2):122-125. 7. Cobey MC. Ochronosis. A case report. Clin Orthop Relat Res 1972 Sep;87:233-234. 8. Dom K, Pittevils T. Ochronotic arthropathy: the black hip. Case report and review of the literature. Acta Orthop Belg 1997 Jun;63(2):122-125. 9. Aydoğdu S, Cullu E, Ozsoy MH, Sur H. Cementless total knee arthroplasty in ochronotic arthropathy: a case report with a 4-year follow-up. J Arthroplasty 2000 Jun;15(4):539-543. 10. Jahan F, Nanji K, Qidwai W, Qasim R. Fibromyalgia syndrome: an overview of pathophysiology, diagnosis and management. Oman Med J 2012 May;27(3):192-195.